1. Another Facebook controversy: Facebook said Tuesday it has provided access to its users' data to Huawei, a Chinese smartphone maker that US intelligence agencies have described as a security threat. Facebook (FB) said it has been operating data-sharing partnerships with four Chinese device makers -- Huawei, Lenovo (LNVGF), Oppo and TCL -- that enabled the companies to create Facebook-like experiences for their users. The news is set to fuel further concerns about how Facebook handles people's personal information and protects their privacy. Shares in Facebook closed 0.2% lower on Tuesday. 2. Google faces shareholders: Google's parent company, Alphabet (GOOGL), will hold its shareholder meeting Wednesday. Some shareholders will ask the company to link executive compensation to diversity targets. Google, like many tech companies, has struggled to hire and promote women and people of color. The measure is not expected to pass. 3. New life for ZTE? ZTE (ZTCOF) is reportedly inching toward the lifting of a ban on buying US components. Reuters has reported the company, one of China's biggest smartphone makers, has signed an agreement in principle that would lift the US Commerce Department ban. The Trump administration blocked American firms from selling parts or providing services to ZTE in April. The company's shares have been suspended from trading since then. 4. Australia's boom: Australia has posted better than expected GDP growth figures. The economy expanded by 3.1% in the year ended March. "Australia stands out as one of the few advanced economies that strengthened at the start of the year," said Paul Dales, chief Australia & New Zealand economist at Capital Economics. However, economists are warning the growth in the first quarter might be as good as it gets for Australia. The country's housing market is showing signs of weakening and consumption growth is slowing. The Dow Jones industrial average closed 0.1% lower on Tuesday, while the S&P 500 added 0.1%. 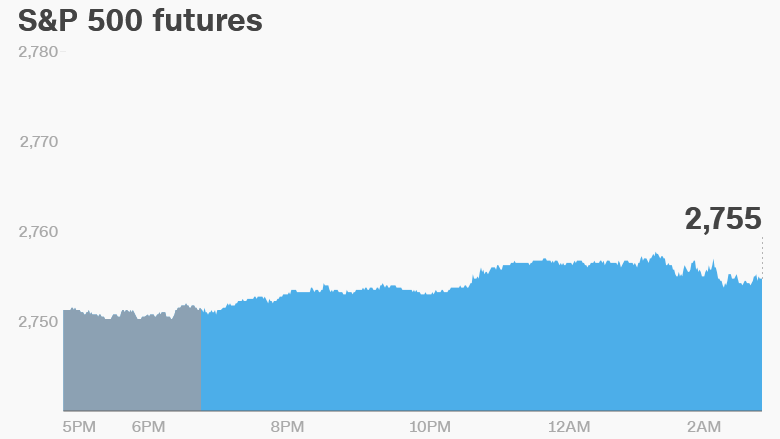 The Nasdaq gained 0.4% and hit a new record high. 6. Earnings and economics: Signet Jewelers (SIG) will release earnings before the open. The US Census Bureau will release its trade balance report for April at 8:30 a.m. ET. The weekly US crude inventories report will be published at 10:30 a.m.
India's interest rate decision is expected at around 5 a.m.